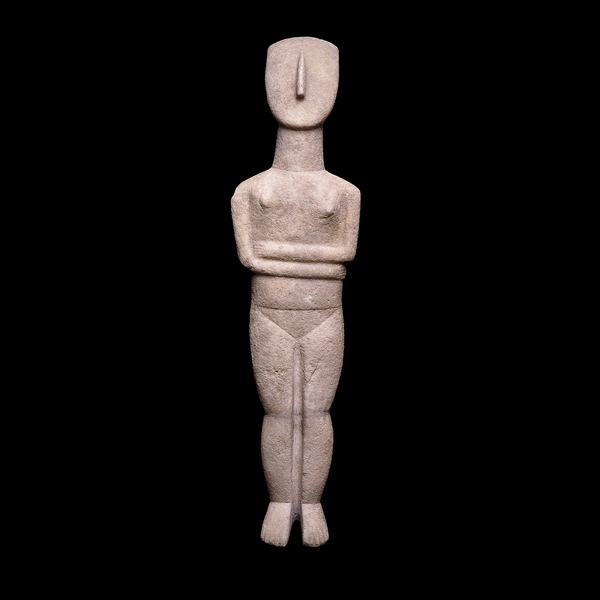 Marble figurine of a woman, from the Cyclades, Aegean Sea, early Bronze Age, about 2600-2400 BC (via the British Museum). The 2015 Lancet Commission on Health and Climate Change was formed to map out the impacts of climate change and the necessary policy responses. The central finding from the Commission’s work is that tackling climate change could be the greatest global health opportunity of the 21st century. See a summary of the key messages of the paper, published this week in The Lancet (22 Jun 2015)—Health and climate change: Policy responses to protect public health. One of the authors of the paper is ILRI veterinary epidemiologist and food safety expert Delia Grace, of the International Livestock Research Institute (ILRI) and the CGIAR Research Program on Agriculture for Nutrition and Health (A4NH). Another is her colleague Victor Galaz, professor of politics at the Stockholm Resilience Centre and, like Grace, a fellow partner in the Dynamic Drivers of Disease in Africa Consortium led by the STEPS Centre. 6 years ago, the first Lancet Commission called climate change ‘the biggest global health threat of the 21st century’. Since then, climate threats continue to become a reality, GHG emissions have risen beyond worst-case projections, and no international agreement on effective action has been reached. The uncertainty around thresholds, interactions and tipping points in climate change and its health impacts are serious enough to mandate an immediate, sustained, and globally meaningful response. The direct effects of climate change include increased heat stress, floods, drought, and increased frequency of intense storms, with the indirect threatening population health through adverse changes in air pollution, the spread of disease vectors, food insecurity and under-nutrition, displacement, and mental ill health. High-end emissions projection scenarios show global average warming of 2·6–4·8°C by the end of the century, with all their regional amplification and attendant impacts. Many mitigation and adaptation responses to climate change are “no-regret” options, which lead to direct reductions in the burden of ill-health, enhance community resilience, alleviate poverty, and address global inequity. 01 Invest in climate change and public health research, monitoring, and surveillance. 02 Scale-up financing for climate resilient health systems world-wide. 03 Protect cardiovascular and respiratory health by ensuring a rapid phase out of coal from the global energy mix. 04 Encourage a transition to cities that support and promote lifestyles that are healthy for the individual and for the planet. Bold political commitment can ensure that the technical expertise, technology, and finance to prevent further significant climate change is readily available, and is not a barrier to action. 05 Establish the framework for a strong, predictable and international carbon pricing mechanism. 06 Rapidly expand access to renewable energy in low-income and middle-income countries. 07 Support accurate quantification of the avoided burden of disease, reduced health-care costs and enhanced economic productivity associated with climate change mitigation. Health professionals must be leaders in responding to the health threat of climate change and reducing inequities within and between countries. 08 Adopt mechanisms to facilitate collaboration between ministries of health and other government departments (a siloed approach to protecting human health from climate change will not work). 09 Agree and implement an international agreement that supports countries in transitioning to a low-carbon economy. 10 Develop a new, independent Countdown to 2030: Global Health and Climate Action to provide expertise in implementing policies that mitigate climate change and promote public health, and to monitor progress over the next 15 years. The Collaboration will be led by this Commission, reporting in The Lancet every 2 years, tracking, supporting, and communicating progress and success along a range of indicators in global health and climate change. Read the whole paper: Health and climate change: policy responses to protect public health, The Lancet, 22 Jun 2015. Read a STEPS Centre blog article about The Lancet paper: Reports on climate change and health forecast gloomy future but ‘no-regret’ options may save the day, 23 Jun 2015. Read a related recent publication also co-authored by Delia Grace along with her colleagues at ILRI and the CGIAR Research Program on Climate Change, Agriculture, and Food Security (CCAFS)—Info Note, Impact of climate change on African agriculture: Focus on pests and diseases. Findings from CCAFS submissions to the UNFCCC SBSTA, CCAFS, May 2015. Tags: Delia Grace, Dynamic Drivers of Disease in Africa Consortium, Lancet Commission on Health and Climate Change, The Lancet. Bookmark the permalink. In a new paper published on 23 June 2015, the 2015 Lancet Commission on Health and Climate Change says that tackling climate change could be the greatest global health opportunity of this century, and puts forward 10 recommendations for governments to take action in the next 5 years. Yes it will be remarkable step of the human being. This report says it all about the devastating climate change of the 21st century. Most of the changes are seen in the previous few years. Recent NASA images have made it clear that temperature has increased above the poles, which raised the sea level to a horrible extend. It also tells us that most of the ice of North Pole has melted already or will disappear in coming years and the temperature is continuously increasing over the South Pole too. Climate change will affect humanity directly and only way to tackle this issue is through the combined efforts from human community world widely. The five year recommendation published in the report are good steps to start with if individual governments can come to a common platform and start working to tackle the issue avoiding their political difference. Because we must understand the importance of the subject as it will going to affect all of the humanity and other species of our planet. The report speaks it loudly that how we can change this disaster into an opportunity to prepare a platform for all the countries to work together in the direction of good health of our community.